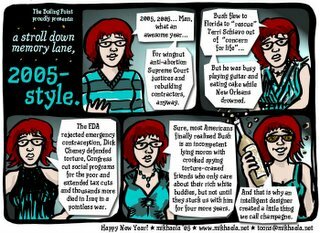 New Cartoon: 2005: The Year in Review! Self-explanatory, really. Except I don't really drink champagne. P.S. This is your last chance to buy some stuff from me before my sale ends, like a signed print or even the original of the above cartoons! Join my weekly mailing list by sending a blank message to newtoons-subscribe@mikhaela.net!